Less for drone lovers, more for outdoor moviemakers. When Karma was unveiled last month, there were two main takeaways. First was the lack of much-expected "follow me" features; second was the inclusion of a (not-expected) hand-held stabilizer, turning Karma into a "kit." GoPro CEO Nick Woodman would declare Karma to be "much more than a drone," pitching it as a complete video-stabilization system -- one that can be worn, held and flown. The big question was, would that be enough for buyers to overlook what appeared to be a pared feature set on the drone itself? At $799 (if you "bring your own camera"), and $999/$1,099 if you want to include a Hero5 Session or Black, Karma is priced aggressively, undercutting DJI's Phantom 4 if you factor in the cost of the hand-held stabilizer (DJI's cheapest equivalent costs an extra $300). But then DJI revealed the Mavic Pro and set fire to GoPro's plans. It's smaller, similarly priced and bests GoPro across the spec sheet. The question now is: Will GoPro's claim of being more than a drone be enough to lure casual filmmakers away from DJI's technologically superior product? 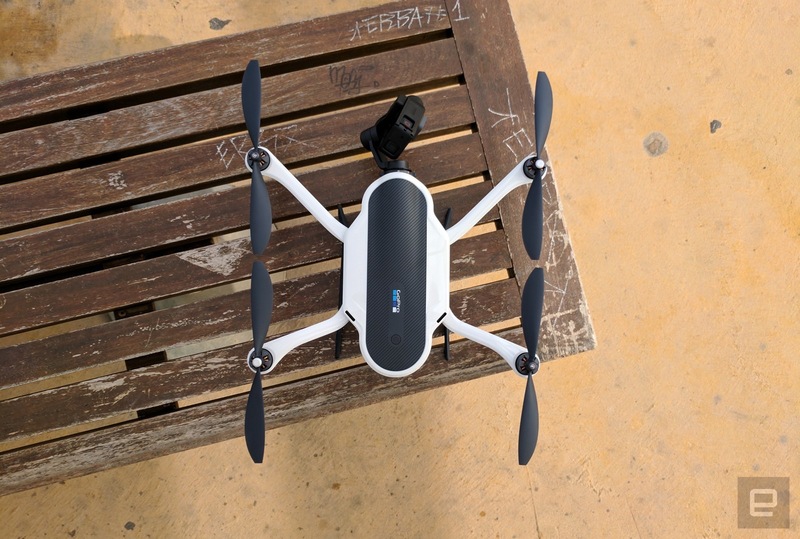 On November 8th, 2016, GoPro issued a global recall for the Karma drone following cases of electrical failures causing a loss of power during flight. GoPro advises that owners can return their units to GoPro, or their place of purchase for a full refund. No replacements are being offered at this time. Though this review is still live on Engadget's site for posterity's sake, we have elected to remove the original score. Should GoPro resume selling Karma, we will re-asses our review and score accordingly. Be the first to review the Karma? What comes in the box depends on whether you need a GoPro. If you're buying a bundle that includes a Hero5 camera, you'll save $100 versus buying it and the Karma individually, which isn't bad. All the bundles come with the following: a Karma drone, six propellers, a touchscreen controller, the hand-held "Grip" stabilizer (also called a "gimbal") and a backpack to hold it all. There's also a charger with connectors for the batteries as well as USB Type-C, so you can simultaneously recharge the drone and the controller or Grip (or anything else powered by USB-C). Karma's party trick is the removable gimbal, which you can swap from the drone into the Grip for smooth videos shot both in the sky and on the ground. There's also a clip that makes the Grip compatible with existing GoPro mounts. Therefore, if you have a selfie stick or a helmet mount for your camera, it's theoretically compatible with the Karma Grip, which means you can stabilize your GoPro almost anywhere you can mount it (almost). It won't make sense to attach the Grip to everything -- a headband mount would have it in your face, for example -- but there are many creative ways to add it to your workflow and achieve interesting, stabilized video that previously wasn't possible. While the drone is probably what you're buying Karma for, the Grip adds a huge amount of functionality. And while the drone is where all the fun is, there's a good chance you might end up using the Grip more. GoPro refers to Karma as a "stabilization system." It's easy to see this as the company positioning Karma as a camera product, as opposed to a drone competing directly with the Phantom 4 or Mavic. I'll revisit this point later on, but for now keep that thought in mind. As quadcopters go, Karma is not bad-looking. 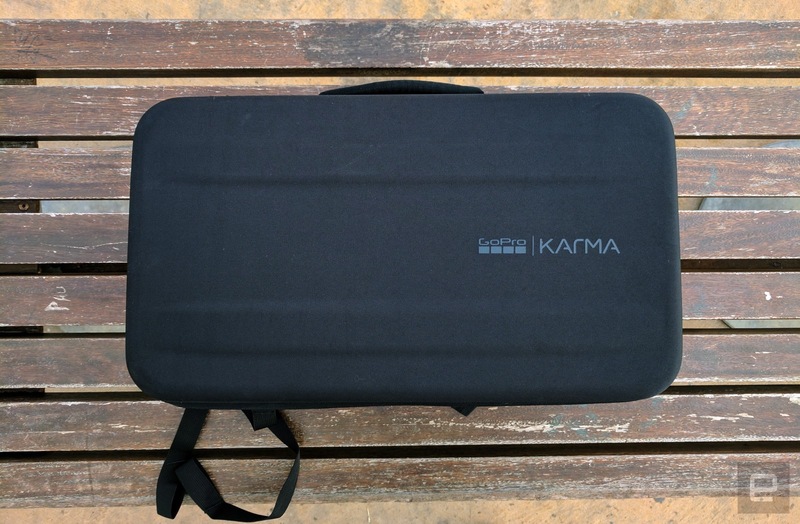 Folding arms and collapsible landing gear mean Karma packs down to a very low profile. Much lower than any Phantom, certainly, though Karma is considerably longer and wider than Mavic. Unfolding Karma takes seconds, and folding it back down is weirdly satisfying in the way it all neatly clicks together. Karma's body is mostly made of glossy white plastic, with a contrasting gray underbelly and a gray soft-touch section on top that complements the shiny lid. Whether you think it's better-looking than the Smurfy white curves of the Phantom or the masculine Mavic will be a matter of personal taste. Karma's controller looks and feels like a gadget in its own right. 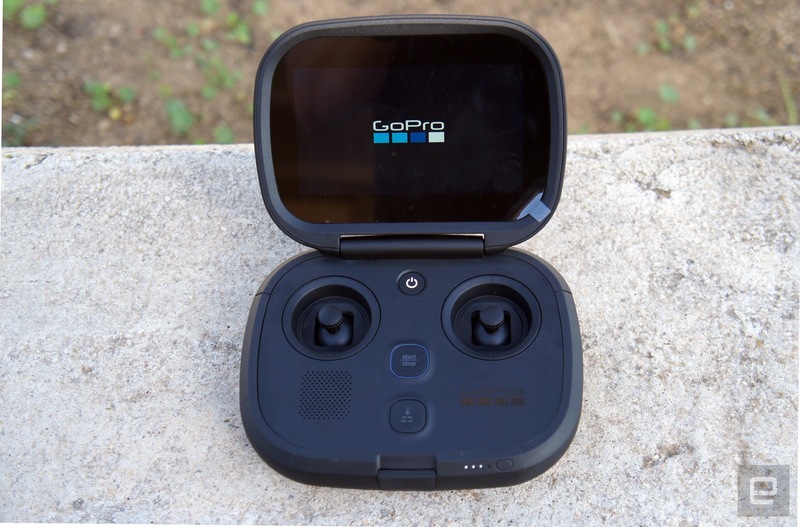 GoPro built in a 5-inch, 900-nit 720p display, which is kept safe from the elements by a clamshell design. Unlike many RC controllers (aka transmitters) that have metal knurled "sticks," Karma's has smooth sticks with a rubberized finish. The controller is weighty but comfortable to hold, and the lack of external antennas make it feel infinitely less geeky than a regular transmitter. The Grip has a similar aesthetic as the controller, with a gunmetal color and flush buttons. Unlike most other hand-held GoPro stabilizers, it features buttons that control the camera directly. There are buttons to turn the camera on and off, set highlight tags, start and stop recording, and change modes, as well as set the camera's angle in the grip (you can also do this manually). No need to touch the GoPro at all. Overall, everything is well-made and carefully engineered. 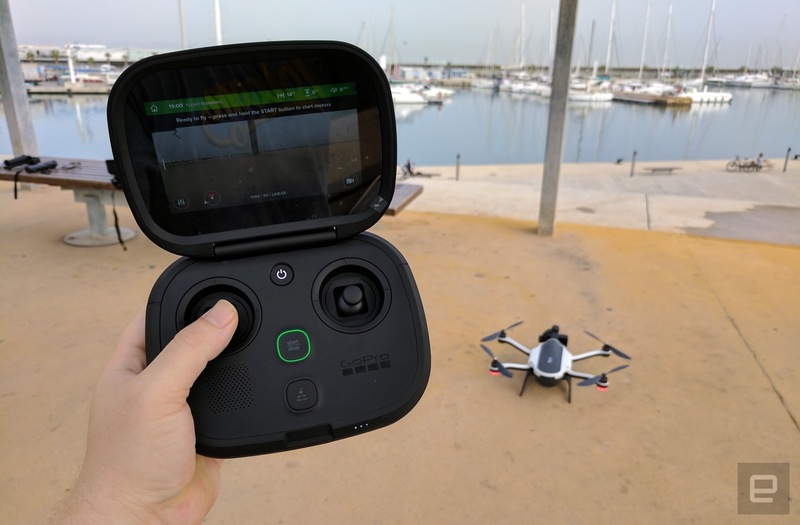 For example, the drone batteries have a spring-loaded handle on the rear that satisfyingly extends as you pull the battery out, and neatly tucks itself away as you slide it back in. Similarly, if you charge the Grip with the camera in it, you'll charge both at the same time. Even the backpack has a few thoughtful details, such as a GoPro quick-release mount on the strap for mounting the Grip on (with the aforementioned adaptor). You need to keep the straps tight to stop it from flopping about, but it's a nice touch. Karma drone's battery life is estimated at 20 minutes. In practice, it's somewhere around 17 minutes, depending on how you fly. Drone battery life is always something of a guessing game. DJI, for example, claims Mavic's battery lasts 27 minutes, but in my experience, I never got much more than 20 minutes of flight time with it. That's better, of course, but still less than advertised. In short, you'll likely want extra batteries, which cost $99 a pop. That's not chump change, but it's on par with or even cheaper than the competition (Mavic/Phantom batteries cost $89 and $169, respectively). So let's quickly talk about what the Karma drone does not have. The most obvious omission is any sort of "follow me" feature, given GoPro's association with self-filming. The basic tools are there -- GPS in the drone and the controller -- but GoPro claims current technology doesn't provide a good enough experience. I've tried GPS-based solutions, and they're prone to jerky motion, as the drone keeps calculating your location. Camera-based object tracking helps eliminate that, but as anyone with a smartphone with facial recognition knows, it's prone to losing its target. There's also a simpler argument as to why it was left out: It's not that useful for most people. Also, it requires obstacle avoidance to be safe -- another feature Karma lacks. Karma also doesn't have downward sensors for helping it keep position, especially indoors (though you can still fly inside). Downward-facing sensors have been around for years -- the original Parrot AR Drone had one back in 2010. Even DJI wouldn't introduce indoor positioning to the Phantom until as recently as last year, but these days it's a feature most people expect on a drone at this price, and it's not here. It's not just for indoors; it helps keep the drone steady outside too. GoPro's outdoorsy crowd might not miss indoor flying so much, but the extra stability would be nice. Obstacle avoidance, however, is a newer technology, with the Phantom 4 being the first from DJI's popular line to support it, and that only came out back in March (about six months before Karma). If GoPro had released Karma around the same time as the Phantom 4 as originally planned, the lack of these sensors wouldn't have seemed so obvious, but ultimately it didn't, and here we are. It's worth remembering that most drones, including Mavic and the Phantom 4, "only" have forward-facing obstacle avoidance -- which is better than none, of course -- but there are still three directions you can crash them from. Similarly, the Phantom didn't get basic follow features until a retroactive update for Phantom 3 at the end of last year. Either way, to GoPro's detriment, six months is a long time in drone land, and Karma's delay has accentuated its shortcomings. So what is Karma like to use? Let's start with the controller, as that will likely be your first interaction with it. The first time you turn it on -- it takes about 30 seconds to boot -- you'll see some basic setup screens. I connected the controller to my home's WiFi network (for updates and downloading maps, etc.) and was soon given the option to learn to fly with the built-in simulator. If you've never flown before, this is a good way to have a few test runs or sharpen your skills between flights. The central power, start and land buttons are reachable with your thumbs, while the shoulder buttons for camera tilt, recording and mode selection/highlight tagging are all easy to access. Typical drone controllers are covered with buttons. DJI's aren't too bad, but others (like Yuneec's) are littered with knobs, switches and dials that can be daunting to new pilots (not to mention, easy to press accidentally). Karma's controller is refreshingly clean and simple, although it does mean fewer dedicated buttons. The 5-inch screen is bright and clearly visible in direct sunlight. Though some controllers use your phone as a display (like the Phantom or the Mavic), I prefer not having to use a phone, at least not for basic flying. First of all, it always feels a bit kludgy. Then, ironically, you have to put your phone in airplane mode or risk receiving calls or alerts while you're piloting. Plus, it's just one more drain on your phone battery. I always found the controller for the Phantom 3 and 4 unwieldy, what with the phone balanced on top in a clip. The Mavic controller sandwiches the phone between two grips at the bottom, which is a better design but doesn't look very elegant. Both scenarios also add to the setup process, as you have to make sure the USB port or WiFi is connected and the phone is securely in place (don't forget to tap to focus, guys). With Karma's controller, you just switch it on and you're set. Much like the physical controls, Karma's on-screen menus are simple and sparse. All the important info is on screen, though. Remaining flight time is shown via a big bar along the top that changes from green to red as it depletes (sadly, all too quickly). On the right-hand side are distance and height. Along the bottom, easily identifiable icons point you toward in-flight settings, camera modes and auto-shot paths. We've come all this way, and we haven't even taken off yet. Let's do that. Getting in the air is pretty simple. Karma will tell you when it's ready to fly (literally -- it has voice alerts). From there, hold the start button for a count of three. Then you can either tap the big on-screen "launch" button and Karma will take off by itself, or manually push upward on the left stick. By default, Karma will have "Easy" mode activated. This limits how high and far you can fly, and also reduces its speed to help prevent over-ambitious maiden flights. Flying in Easy mode can still feel fairly quick, so you'd be smart to stick with that setting if you're just starting out. Once you're feeling braver, you can turn off Easy mode. With a top speed of 35 mph, Karma is no slouch. Again, the Mavic bests it with a top speed of 40 mph, but that's not a huge difference, and requires being in "Sport" mode, which disables the obstacle avoidance. For most people, then, Karma will feel plenty fast. 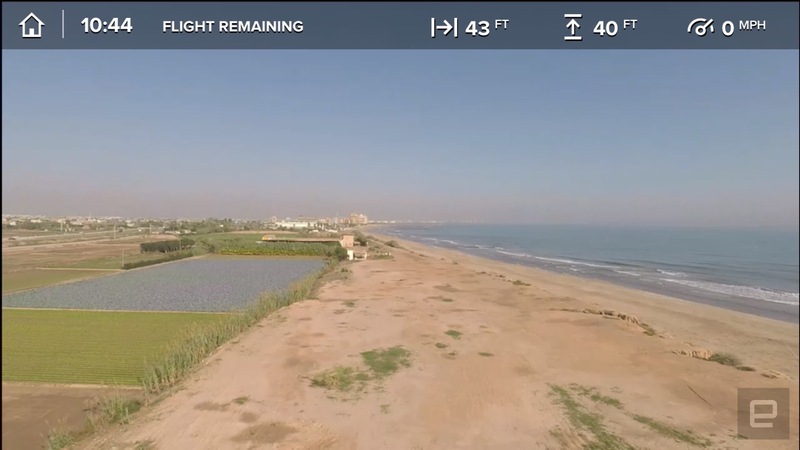 Thanks to the lack of downward sensors, even with GPS connected, Karma can gently drift when you let go of the controls (anyone who's owned a Phantom 2 will be familiar with this). The Mavic, meanwhile, holds its position in the air with almost freakish accuracy. Karma only wanders a foot or two when hovering and you'll quickly learn to make micro-adjustments if needed. Even so, you should stick to wide open spaces at the beginning. Once you're moving, Karma feels nimble yet steady. The 720p video feed to the controller had the occasional glitch on screen, but no more than I've seen with other video links, including DJI. Importantly, there were no freezes, or worse, complete losses of connection, even when flying far away. The uncluttered display is much appreciated when lining up your shots. Both DJI and Yuneec cram all sorts of data onto the screen, and much of it feels unnecessary (motor-rotation speed? ), at least as a permanent fixture on the main screen. Karma has four auto-shot modes that help you get pro-style clips without having to be a flying master. 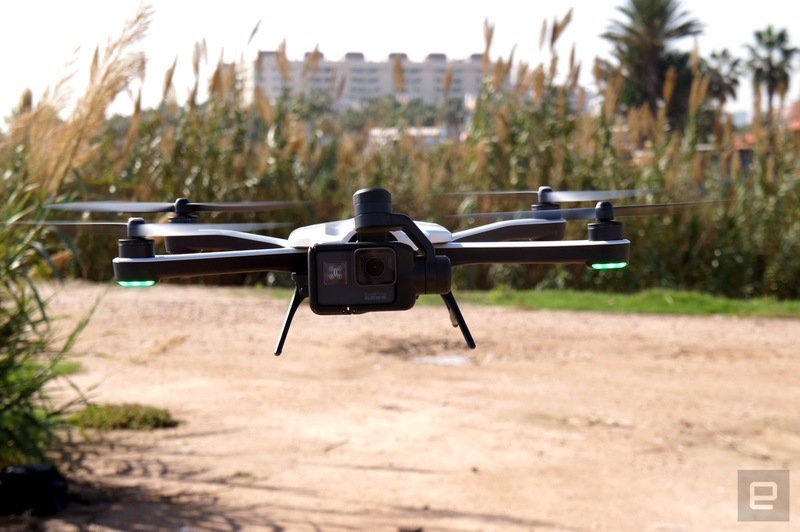 Again, most or even all of these are common on other camera-enabled drones, but given that GoPro is pitching Karma at outdoor amateur videographers, they're especially important. We only have ourselves to blame for the drone selfie mode, or "Dronie." Fly Karma to a starting point, and Karma will slowly, steadily fly backward and upward until you're barely a dot on the screen. It works well enough, but I'm not sure how many times I would use it in my own videos. Your level of proclivity for selfies may differ from mine. "Cable cam" is much more useful, making Karma move between two locations as if on a cable. The start and end points can be at different heights, and you can rotate Karma or change speed while it's moving, which can lead to some great-looking panning shots. I tried this on an empty beach, and it's perfect for complex shots, revealing different parts of the landscape over time (and in three dimensions). "Orbit," as the name suggests, has the Karma fly around a central point. Again, you can change the height and the camera angle as it goes, so you can get creative. This is one of my favorite moves, but it's also hard to avoid catching yourself in shot, which isn't always what you want. Also, having tried Mavic's equivalent mode that can circle a moving target (which is perilous if there are trees or cables around, but very cool). I wish Karma could also do this. Lastly, "Reveal" flies between two points starting with the camera facing directly down, slowly panning it upward for the big, well, "reveal." It's another staple shot that's great for intros. I also found that by lowering the camera tilt speed in settings, I could achieve pretty good "reveals" manually -- a trick I found myself using more often. Now is probably a good time to remind you of the Hero5's "Linear" mode. It's a setting that removes the fish-eye effect common to GoPros. At least know if you're using Karma with a Hero5, Linear mode does away with this effect (the trade-off being that you can't use Linear mode in 4K -- only 2.7K and below). Changing the camera modes from the controller can be done via the onscreen menu, or the "Highlight" shoulder button (when not recording). When recording, the display shows how much recording time has elapsed. Occasionally this number froze, and tapping the record button wouldn't kick it back into gear. On landing, the camera was still recording, so no footage was lost. Still: frustrating. You can actually view all your recorded media via the controller at any time, though, and it works surprisingly fast. A feature that got lost in the official announcement was the companion "Passenger" mobile app. 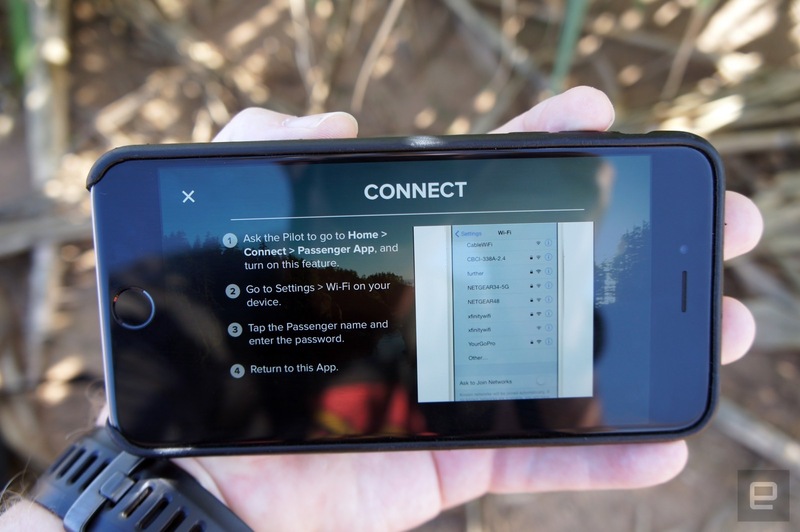 With Passenger, you hand over the control of the camera to someone else via his or her phone. It's simple to set up -- just connect the phone to the controller's WiFi hotspot, grant it access and you're good. I only got it working on iOS, though, as my Pixel couldn't see the WiFi hotspot at all. I asked GoPro about this and was told that Android 7.1 is still in testing. What's more exciting about Passenger is the potential it adds. Earlier I talked about the drawbacks of using a phone for controlling a drone. That's still true when it's required, but as an optional add-on, it can be useful. With Passenger, it could be a direct way to add livestreaming to Facebook or YouTube. Karma's Grip is likely the main thing that will separate people into team GoPro or team DJI; it's a solid value-add if you're in the GoPro ecosystem. Even before Karma, a hand-held gimbal is the first accessory I'd recommend. They are the single biggest upgrade you can give your GoPro videos. As with the drone you can also control the camera directly from the Grip (others you need to touch the camera). 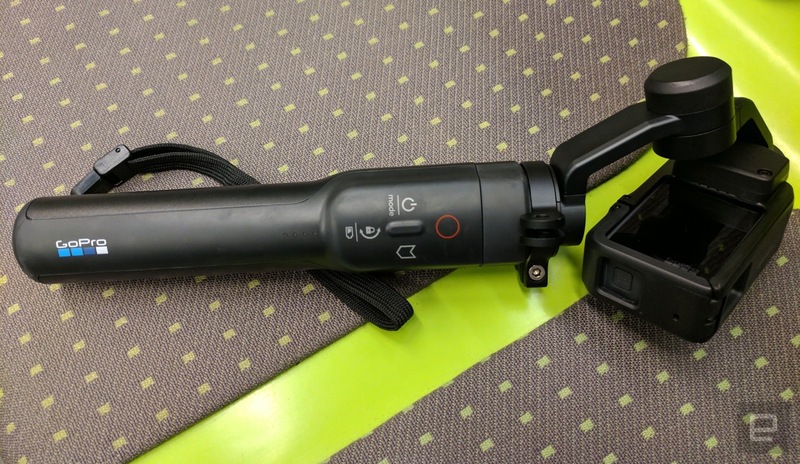 The Grip also charges your camera while you use it, and has a battery life of around two hours. While it's a good all-rounder, it lacks a joystick for manual camera movement. Grip is also rugged. It's not waterproof, but it's at least "weatherproof." The option to attach it to existing GoPro accessories adds almost unlimited potential. I'm interested to see who comes up with the wildest use for it, but imagine silky smooth video from the cockpit of a toboggan, or from the mudguard of a dirt bike. These are all things you can do with Karma that you can't with a drone. During Karma's launch, much was made about how portable the kit was, thanks to the included backpack. It's comfortable to wear, and at around 8 pounds, it's not that heavy. But it's not exactly compact, either. Or at least, it's not compared to the much smaller Mavic. When it was a toss-up between the Phantom 4 and the Karma, GoPro's slimline offering was easily a more manageable choice (at least in terms of size). I've had the pleasure of lugging a Phantom across the Pacific, so I can say from experience that it's doable, but not fun. If you're interested in drones and looking for a smart flying robot that also shoots video, it's hard to recommend Karma over Mavic. But enthusiasts who are only looking for a drone already knew that and didn't need to read this review. If you've gotten this far, it's possible you're into making videos, enjoy outdoors adventure or part of the big old "everyone else" and aren't sure which makes most sense for you. GoPro's Karma is simpler, easy to use and has a singular focus on video. Mavic is gadgety and full of advanced features -- kind of like a gaming PC when you might just want to browse the internet. The flight range of 4.3 miles (compared to Karma's 1.8) is reassuring, but does it affect real-world flying? 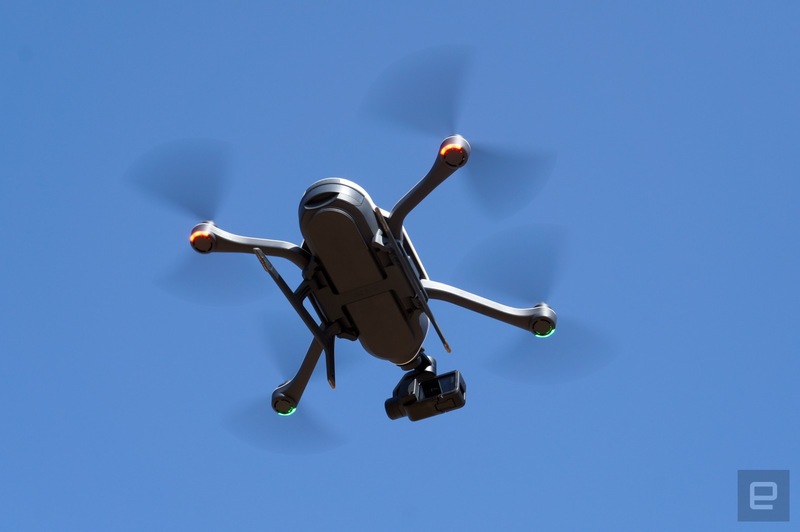 Most aviation authorities, including the FAA, require recreational users keep a visual line of sight when flying a drone -- and both Karma and Mavic can fly beyond that without the video link dropping. Do you need to whiz around a bit faster? It's fun, but so is recording smooth video on your mountain bike. It's harder to argue against more practical differences like battery life. GoPro's isn't bad -- it's just OK. Similarly, obstacle avoidance isn't a neat trick; it can save your drone and prevent accidents. Unlike "follow me" features (or lack thereof, in Karma's case) that will bum a few people out, but it still feels like something people expected, but didn't necessarily need. But then there's the basic practicality that Karma is fun to fly, flies well, has great auto-shot modes and the versatility of the hand-held gimbal. As for your wallet, Karma is a decent deal -- a drone, a camera and a hand-held stabilizer for the price of a Mavic. DJI will sell you a Mavic without a controller for $50 less than the Karma (without a camera), but you have to be willing to trade a lot of usability for that saving, and of course, still no hand-held. It's a much more limited proposition for enthusiastic video makers, albeit a better one for budding pilots. Let's not forget, Karma is still a decent consumer drone. There are just better ones available. But if your focus is video, Karma has much more to offer.